I haven't talked about it much here but I'm signed up for the Chicago Triathlon this year. After my better-than-I-expected, but not-actually-finishing, performance in the marathon two years ago, achieved by following a regimented training schedule mostly on my own, the next logical step would probably be to join one of those group training programs -- either a fund-raising one like Team in Training, or just a paid program -- so that I'd have benefits of the system as well as the encouragement and peer pressure of the group. So, instead, in my usual contrary way, I signed up for a different sport and I'm training without any real plan other than "swim, run, and bike as much as I can". I have a calendar through the date of the Triathlon (the end of August) and I fill in each day with the distances I reached. A couple of blank days in a row reminds me to get out and do something. Shaun is also signed up for the Triathlon and we're swimming together most days we do -- so there's a little bit of peer pressure. 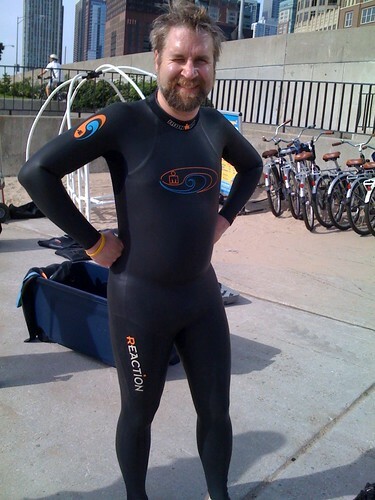 And I am availing of some outside resources -- I went to a little class Fleet Feet held at Ohio Street beach with some tips and tricks for open water swimming and this last weekend I went down there and rented a wet suit from them and went out for my first lake swim. (As Erica notes, I am now a Great Lake Swimmer.) I knew it was going to be hard -- I was going to be swimming a half-mile, which was 50 meters farther than I've done in the pool -- but I was surprised that when I was done I wasn't really physically exhausted but I was mentally wiped. Ohio Street is pretty easy as far as open water swimming goes -- the wall is always right there to sight off of and you can touch bottom for most of it (which won't be the case in the real race). But still the effort of constantly sighting and the unfamiliarity of it all really wore me out. It's such a cliche, but it's true that so much of athletic effort is mental. There are two red markers floating in the water - one at 1/4 mile and one at 1/2 mile. The 1/4 mile one, at least, says "1/4 mile" on it. So I swam out to that one and then back.